The above video lesson demonstrates a peculiar West African fingerstyle guitar with polyphony. If you would like to learn it accurately, I suggest you to download the tab at the bottom of this article! Our current example is not unlike what kora players might play. The Mandinka harp called kora is played in many countries of West Africa, including Mali, the Gambia, Senegal or Burkina Faso. Just like it’s often the case with a kora musician, our guitar piece is played with a shuffle rhythmic feel as well. It means that even though the song is written with regular 8th notes, it has to be played with a triplet feel, as you can hear both in the video and also if you play the tab in GuitarPro. The song is in A-flat major; the chord progression is I-ii-I repeated through to the end. The song has two separate voices, as indicated in the tablature. Our tune begins with such notes. It’s an effective musical device to create the melody line in a way that the notes alternately play in the upper and the lower octave, one after the other. In other words, it’s a nice little trick. Or actually, not so little. It widens the frequency spectrum of the song and generally makes it sound like there’s more going on than there really is. At the end of the 1st measure, the second voice – the bass line – appears the first time, and plays equal length notes in the bottom through the 1st part of the tune. The difficulty of this section lies in both the above mentioned octave-distance melody notes, and the required finger independence. What do I mean by that? Well, it’s just that as you can hear in the vid and see in the tab/sheet music, you have to play two parts simultaneously. These two parts have different note values; their duration is different from each other. Of course once you get the hang of a particular groove of such kind, you’ll be able to play the pattern as a whole again and again, as long as your memory holds it. The 2nd section starts with triplets, even though the beginning of the first triplet is a rest. Don’t let that make you worry. 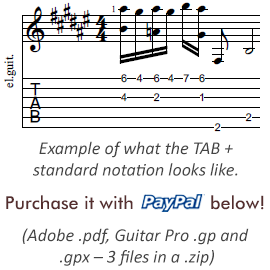 -.- The trick comes with the 2nd triplet though, where you need to hammer-on the last two notes of it. You’re gonna need enough strength so these notes are perfectly audible and don’t stick out like a sore thumb from the rest of the melody line. Speaking of the melody line of the second part, there’s a slight variation between the two versions in this section. These two variations are pretty much what they call a musical question and answer. The finger independence I mentioned above will come handy when you’re playing this part as well. Once you have practised the pattern for a while, you’ll be able to play the separate bass line and the melody on top quite easily. Especially because the bass notes are always quarter notes in this particular tune. Speaking of the bass line; playing with at least a thumb pick will help the low notes stand out, because of the highlighted attack transient. If you want strong, clear ringing notes, give fingerpicks a try as well.